John was born in Wincle, probably in Chapman’s Row, on 2 February 1883 to George and Margaret Ann (nee Hooley). His mother sadly died when he was only two and by 1891 his father, sisters Sarah Anne and Esther Jane and he were lodging with his uncle Abraham and Aunt Sarah Gibson at Braddocks Farm along with four of his cousins Esther, Sarah, Mary, and Samuel (also on the memorial). By 1901 John was living and working as a farm servant/teamsman for Alfred Hine at Bennetts Hill Farm. Ten years later he was back in Chapman’s Row, on his own, and working as a stone mason and at the time of his enlistment in March 1916 he was employed as such by Mr Overfield of Top House in Wincle. He was sent to join the Royal Army Service Corps, in the Siege Batteries, as private no. 220247. He was posted for duty in November 1916 and arrived in France in January 1917. He remained in France with just one fortnight’s leave until after the war’s end but in April 1919 suffered a nervous breakdown. 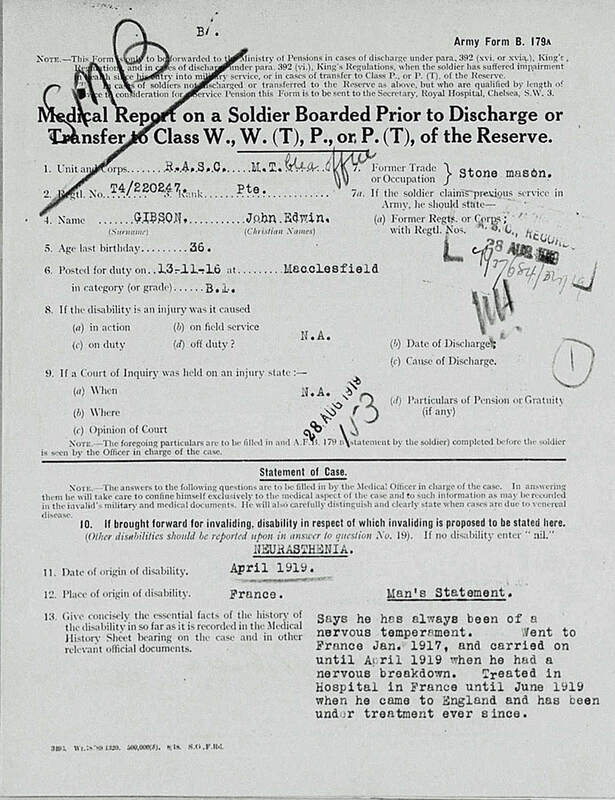 He was initially hospitalised in France but then repatriated to England in June and finally discharged as unfit for duty on 27 August 1919. He was diagnosed with Neurasthenia (50%) and allocated a pension of 20/- a week until March 1920 when his condition was considered as improved (only 20%) and his pension reduced to 8/- a week. A final review in September 1920 reduced his pension further (Neurasthenia <20%), this time to 5/6 a week until September 1921 when it would cease. We have not been able to trace him after the war but we believe he died somewhere in the Staffordshire Moorlands in 1931.